Imagine handing the keys of a finely tuned, bright red Porsche 911 to a 16 year old boy, first time driver and saying have fun! Now imagine telling him 15 years later, after he has been in a few accidents, scratched the paint and destroyed the clutch that he should have driven more carefully because this is the only car he will ever own for the rest of his life, that he will now have to go for regular tune ups and will probably have to get an artificial clutch and a titanium tire sometime in the next 30 years. Oh yeah and your shocks will get worse and worse every year. I hope you had enough fun driving in the first 15 years to make the next 40 years worthwhile! Sorry I didn’t teach you to drive better! We watch our kids struggle to reach the gas pedal for years then blindly let them grind the gears of their own bodies through their adolescence. We put them into sports in key developmental years that unknowingly teach them how to move a particular way and may mold their posture for the rest of their lives. We tell them to stand up straight with little context of what that means and we start binding their feet with stiff little shoes before they can even walk. Children are resilient, moldable little sponges that should be given some direction and opportunity to become good drivers in their own bodies. The trouble is that most parents aren’t particularly good drivers and their kids think that they are invincible until they reach their mid twenties. Babies can move, but very little of it is intentional. Most of their movement is created by a series of reflexes that move an entire limb as one unit. The back extensor muscles develop before the abdominals as the baby figures out how to lift its head up and arch its back. Once a baby starts to develop a bit of awareness of the world around him, he starts to try and figure out how to find the manual override on all these reflexes that keep making him smack himself in the face and kick uncontrollably. Anyone that has watched an infant try to pick up a Cheerio and put it in his mouth for the first time will know what I am talking about. Getting his hand to the Cheerio is feat number one, opening his fist is feat number two, jamming his tightly closed fist all around his face to find his mouth is battle number three and finally opening his hand and sticking the Cheerio to the side of his head is frustration number four. He starts again and repetition finally brings him success! Movement experience creates movement skill. A variety of movement experiences from a young age creates a more refined control of one’s body. A strict regimen of the same movements from a young age can create talent, but at the same time limit the body’s potential for a variety of movement skills. The best example is young girls that are put into ballet and gymnastics from the age of three. There is an emphasis on lifting the chest, depressing the shoulders, swaying the back and toeing out the legs. These are postures that we consider esthetically nice, but are biomechanically awful for your body. It is these girls that are the most likely to tear their ACL in their knee when they try and play soccer as a teenager. I have been a physiotherapist for 8 years and without a doubt the group that experiences the most pain later in life due to their childhood sports are those that did a lot of ballet, dance and gymnastics from a very young age. I believe that one of the reasons men tend to be generally more athletic than women is largely because their father’s and brothers wrestled with them as children. It teaches the kid to twist, push, pull and run- all fundamental movement patterns. Female animals may not be as physically strong as their male counterparts, but they are just as athletic because they get similar movement experience in the wild to the males. The best preventative health tool you can give your child is to encourage him/her to participate in physical play and a variety of sports and use the times when they injure themselves as opportunities to teach them about their bodies. Both of my parents were PE teachers when I was young, and both of them had their fair share of injuries. 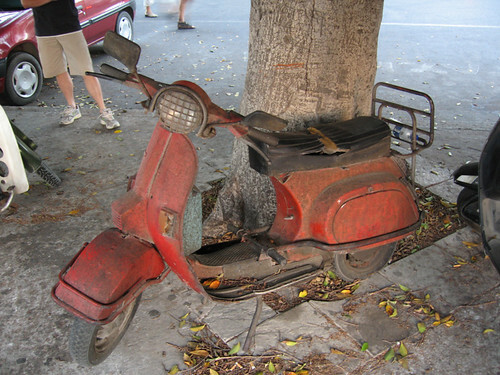 eventually feel like a rickety old moped.